Just east of Greenwich, London. Or to give it in more modern terms, right next to the Millenium Dome. And what's this here for then? Oh yes - that's it! In practice, the A102(M) was lost a little earlier, in 1999. Let me guess - it's a remnant of one of those London Ringways? That's right - this was the southeastern section of Ringway 1. Oddly, the Blackwall Tunnel Northern Approach was never designated as a motorway, only the Southern Approach. I have no idea! The Blackwall Tunnel itself was also never designated as a motorway, despite some 1970s maps telling you otherwise. 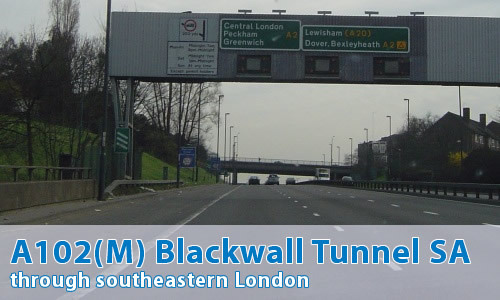 Trivia time: the Southern Approach opened on the same day as the second Blackwall Tunnel. What should have happened at the southern end? Surprisingly, or not if you've been paying attention, it would have met the South Cross Route, which would have headed across to Battersea where it would have met the West Cross Route, or M41. Can I see some photographs then? Although the motorway has gone, not all the signs have. On the A2 and M20 approaching London, there are height warning signs with the A102(M) still on them. One left would have be a mistake, an overlook. But 2? Regarding the height indicator for the Dartford tunnel. The height limit for the Northern Blackwall tunnel (Brunel's original) is 13'4", which is pretty low as witnessed by the amount of Lorries that get stopped & diverted off by tunnel control. They're hoping the drivers know the height of their vehicle & the height of the Blackwall pipe & are letting them know they can get through the Dartford crossing. A lot of drivers seem to take the chance as it's obviously a quicker route, or don't know their height but there's no fooling the 1st set of height-sensitive electronic beams which turn on a warning to divert them off the road at the next slip & the 2nd set illuminate the red traffic lights at the tunnel entrance if they ignore the warning. There then comes a loud announcement telling them to take a walk of shame to the phone on the wall where they are instructed to drive up the steep exit ramp at the mouth of the tunnel while everyone stuck at the red light curses them. Many Foreign Truckers get caught out here. The comment about the n/bound (original) Blackwall tunnel. It had nithing ti do with Brunel, who had been dead nearly 40 years by the tie it was built in the late 1890s. It was in fact desgined by Sir Alexander Binnie. Brunel's tunnel was further upstream, at Wapping and, although designed as a dual carriageway road tunnel, was never used as such.